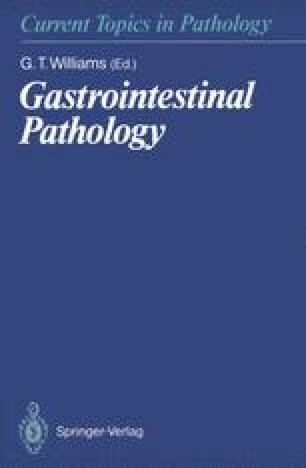 In a retrospective study of 81 patients presenting with colitis after the age of 50 years, ischaemic colitis was diagnosed in 75%, one-half of whom had an original discharge diagnosis of ulcerative colitis or Crohn’s disease. The authors (Brandt et al. 1981) claimed ischaemic colitis is the commonest cause of colitis in this age group. Whether or not this is the case, ischaemic bowel disease is an underdiagnosed entity. It is clearly important for the pathologist to recognise the basic patterns of ischaemic bowel disease and not to overdiagnose Crohn’s disease and ulcerative colitis with their consequent major clinical and social implications. Recognition of ischaemic damage in a biopsy will direct the clinician’s attention to investigate the vascular system, either the major vessels, or, in the correct setting, causes of systemic vasculitis. Drugs may be implicated in some cases (Riddell 1982), as may mechanical factors such as mucosal prolapse (DU Boulay et al. 1983). Ischaemia has always been thought to play a role in severe bowel infections, in particular those due to Clostridia spp., via the vasoconstrictive effects of released bacterial toxins (Marston 1977). Ischaemia therefore envelops a wide spectrum of disease entities in which the basic event is an insufficient blood supply for the needs of the mucosa.